Whether you are in between publishing classes or are looking to increase your monthly earnings, marketing your existing channel of classes on Skillshare is a great way to drive minutes watched and referrals on a regular basis. Skillshare students are always looking for ways to level up their skill set, so highlighting individual skills they can learn from your class content is a great way to increase your minutes watched in older classes. Try this tactic out by sending a Discussion post to your following that lists relevant skills within your classes. 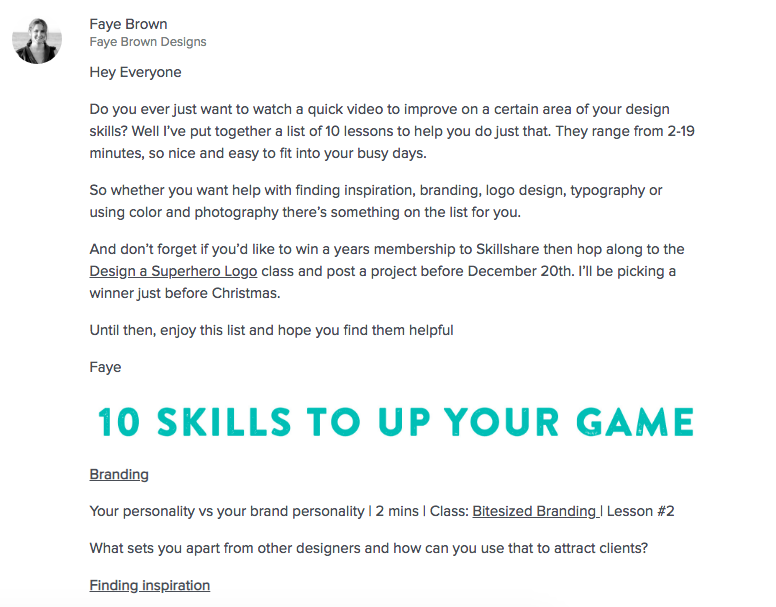 Faye Brown shared 10 specific skills taught in her classes on Skillshare as a way to re-engage her following in her channel. Sharing the exact video lesson and linking the classes for her students made it easy for them to start watching right away. Announce your class milestones on social media to drive more minutes watched and referrals. Plus, seeing that other students have taken the class gives you additional credibility as teacher. Aga Naplocha used the milestone of reaching 100 students as an opportunity to remind her Twitter followers about her class and direct them to watch via her class referral link. Add your channel referral link to your YouTube profile to drive engagement back to your classes over time. Not active on YouTube? Start by uploading your class intro videos to build an audience. Yasmina Creates shares shorter tutorial style videos on her YouTube channel, while also using their platform as another way to drive viewers to her Premium class content on Skillshare. Consider writing about your experience on Skillshare through a Medium post or your own website, which helps give your followers an insider look at your process. Andrew Couldwell wrote a Medium post about creating his first class, which highlighted his unique process and increased awareness of Skillshare. In addition to linking to Skillshare throughout the post, he added his class referral link at the end. Share one of your older classes on Skillshare with your online following. It will serve as both a reminder for your students and an announcement to any new followers you have. Peggy Dean re-markets her older Skillshare classes on her Instagram stories as a way to highlight her extensive catalog of classes. Try out one or all of these tactics and you will be well on your way to growing your following and increasing your monthly earnings on Skillshare!